Becky is a full time Stampin' Up! demonstrator (oh wouldn't that be great) that comes up with these super cute projects. Check out her blog if you are interested in what she has to offer. This is the cute little chest. It's really simple when you break it down. Just a few box bottoms with few sleeves then tape them all together...slap on a couple of panels of CS and you got it. I'll have more goodies to share in the next few days. I can't wait to load this thing up with brads and such. The second picture is to show how much room is in each drawer will hold. Card Stock - SU - Kiwi Kiss textured cardstock, Raspberry Tart DSP and Pixi Pink card stock. Wow! That is so neat! I love that Raspberry Tart paper. It's one of my favorites and normally I wouldn't like Kiwi Kiss but it's growing on me. Great job! This is beautiful and looks crazy hard. Hmmm....will have to go to this blog and check it out for myself, lol! TFS! This is so adorable, it looks like it took a lot of work. Maybe I'll try this, I'll put it on my to do list. Thanks for sharing. Very sweet box and it's also very useful. =) TFS! 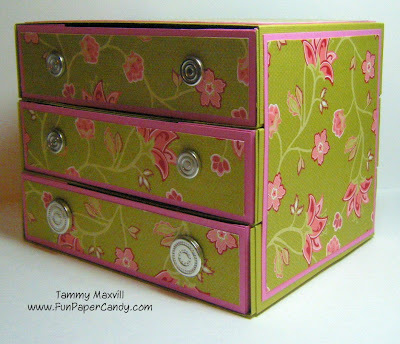 this is a cute idea for a little organizer to give...it's perfect. I am glad you made one...too bad you have to pay for the tutorial! but you did a wonderful job with it!